Naruto Shippuden: Ultimate Ninja Storm Revolution is the latest game in publisher Namco-Bandai’s Naruto: Ultimate Ninja line. The hopes when coming out with a latest installment is that it is better than its predecessor. Developer CyberConnect2 definitely delivered on that. There’s a lot to cover, so bear with me. Everyone will (hopefully) agree when I say gameplay is the most important aspect of a fighting game. It’s an important aspect in any video game, don’t get me wrong, but it’s especially important in fighting games. 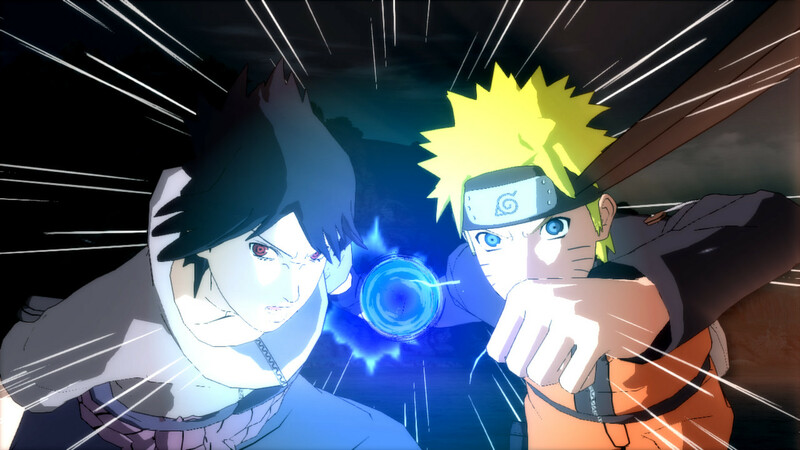 Naruto Shippuden: Ultimate Ninja Storm Revolution has some solid gameplay mechanics. New to the series are guard-breaks and counterattacking. Guard-breaking essentially allows you to wear down an opponent who is guarding, and then unleash a barrage of attacks on them. There is a limit to how many times a player can use guard-break during a game. Counterattacking is self-explanatory, and has no limits, but uses up chakra. This game also changes up how supports work. Let’s say, for example, you only ever want to play this game using Naruto, Sakura, and Sasuke. Normally that’s just asking for the game to get stale fast. However, Naruto Shippuden: Ultimate Ninja Storm Revolution adds in different types of teams—Drive, Ultimate Jutsu, and Awakening. Drive types use Sealed Barriers to activate the Support Drive ability. From there, Support Drives can call in their teammates to attack or defend, depending on the type of support the character offers. Ultimate Jutsu types charge up their energy to unleash massive attacks, which vary based on the team you are using. Finally, Awakening types can temporarily change into a stronger form. Combos in this game have found somewhat of a sweet spot. To have fun in this game, you can’t just mindlessly button mash. You could…and you might just win all the battles, but you won’t have any fun. Luckily, you also don’t have to memorize these insane combinations of button presses to execute moves. The combos are simple enough, and allow you to really flesh out your plan of attack and get some nice variety in your combats. The storm gauge fills up every time you land a hit or get hit, and is what’s used to activate your ability, based on what type of team you are. For example, an Ultimate Jutsu type will fill up the storm gauge, charge up their chakra, and execute a simple combo to unleash their massive team attack. The chakra gauge fills up in a similar matter and is what’s used to perform dashes, counterattacks, and jutsu’s. Players can also manually charge up their chakra, at the cost of becoming vulnerable to incoming attacks. Finally, the substitution jutsu bars. There are four of them, and they fill up over time, so players have to use them strategically. With the right timing, players can completely avoid an attack and appear behind their opponent and surprise them. Finally, the camera. My biggest complaint sometimes when it comes to a 3D fighting game is how sucky the camera is. Games like Mortal Kombat or Marvel vs. Capcom work fine, because they’re 2D fighters with a camera that for the most part, doesn’t even move. The story changes when you make the move to 3D. Luckily, the camera gives relatively little problems. I actually won’t spend too much time on this area of the game. If you want to just skip ahead to the next section, here’s all you need to know—the graphics in this game are spot on and the sound is as well. The colors in Naruto Shippuden: Ultimate Ninja Storm Revolution are so bright and vibrant, and the character designs are amazing. I always felt there were issuing making 3D designs for characters who were originally made in 2D. However, this game proves to be one of the exceptions to the rule. Turning up the settings on your PC, will cause the game to look nicer, but will also cause noticeable lag if your rig can’t handle the stress. Now, I may be one of the few people who prefer to watch/play something like Naruto with the Japanese voices on. Luckily, for those of you like me, that option is included in the settings and it is oh so amazing. The English dub is pretty good as well, so you won’t be let down either way. As for the music and the action sounds, they’re pretty standard. There isn’t anything spectacular, but at the same time, it won’t make you want to bash your head in. I find it rare that games nowadays have enough quality content in them to warrant the $50-60 price tag. Again, speaking in terms of just content, I find that RPG’s are usually the most worth the money. Surprisingly, Naruto Shippuden: Ultimate Ninja Storm Revolution has a LOT of content. Enough, in my honest opinion to warrant the full retail price. The main attraction in this game is the Tournament mode. You register a character as a fighter in the tournament, and start off on the lowest rank. Become the champion of that rank, and you unlock the next one up. As you complete battles and climb the ranks, you’ll unlock plenty of side missions. These side missions range from answering questions to a test, finding flowers, or battling other characters outside of the tournament. You can recruit new members to use as support in your battles, and you can complete special challenges. That’s really all there is too it, and while it may sound fairly simple, what makes it fun is that you unlock a lot more with every rank you beat. Next up is the online battle mode. I’m going to be completely honest and say that I had a rough experience trying to play online battles. However, I won’t blame the game, because I’m not sure if I just had the bad luck of being connected to players who either have bad internet or who are extremely far away. All the battles I fought were laggy, and for me at least, unenjoyable. So, online battles not working out so well for me, I turned my attention to the Free Battle mode. It’s the equivalent to any other mode in a fighting game where you just jump straight into the action after picking your character. There are no side missions, no characters to talk to, just non-stop action. Now, within Free Battle mode, there are various options. There’s a survival mode, tournament, a single versus battle, league battles, and good old practice. Last but not least is Ninja Escapades. This mode consists of three original stories, dealing with the Akatsuki, Shisui Uchiha, and Kushina Uzumaki. The cutscenes that narrate the story between battles look like they came straight from the show, but they didn’t, because these are never before scenes. It’s a really nice treat, being able to see this stories unravel. Finally, let’s talk about unlockable characters and items. There are 118 playable characters, including an all new Mecha-Naruto. One problem that fighting games have when they have such a huge roster is that some fighters don’t have enough variety between them. Luckily, this doesn’t happen all too often. There are some characters that feel alike, but there are also a lot of characters that feel different. You can unlock costumes for fighters, as well as items to customize them with. Things such as substitution items, or items to wear on their clothing. There are also a lot of character videos to unlock, some of which can be set to play in a battle when you achieve an Ultimate Jutsu finish. So I’ve tried my best to condense this game for you readers, but for the rest, you’re all going to have to purchase this game and experience it firsthand for yourself. Naruto Shippuden: Ultimate Ninja Storm Revolution is a really great game with very few shortcomings. Things like lack of a true story mode, having similar characters, and the possibly laggy online mode barely hinder the amazing graphics, the revamped gameplay, and the scope of this game.